Cork driver Keith Cronin’s hopes of a dream prize drive in the 2014 FIA World Rally Championship slipped away after an accident on Wales Rally GB ended his challenge for victory. Cronin and co-driver Marshall Clarke came to the event locked in a winner-takes-all battle for the Citroen Top Driver title but a collision with a tree on Friday sidelined the pair – despite a valiant effort to rejoin the event and chase vital points. The Irish driver’s challenge didn’t get off to the best of starts when a puncture on his Charles Hurst Citroen DS3 during the second stage on Thursday evening saw him drop over one minute. From then on, the pressure was on to claw back the time and aim for the top spot. However, on Friday morning, they went off the road on the high-speed 32.13km Myherin stage with the Citroen careering head-first into a tree. The sump-guard took the full force of the smash and caused damage to the gearbox. 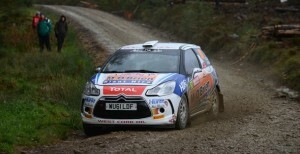 Co-driver Clarke was taken to hospital for medical checks but was given the all-clear later that evening. Continuing to chase the dream, the DGM team set about repairing the car overnight and, after some last-minute gearbox issues, completed a sterling job to have the car ready with just seconds to spare. Demonstrating a never-give-up attitude, the Motorsport Ireland-backed crew returned to action on Saturday in the hope that their rival, Frenchman Sebastien Chardonnet, would hit problems. They set a series of solid stage-times over the long day’s seven forest stages to the south of Rally HQ and again continued to push on today’s final loop of timed action across north-Wales. But their hopes were dashed when Chardonnet crossed the finish line to seal the Citroen Top Driver title and, with a handful of points, Cronin cruised across the podium to secure third overall in the series. Despite the misery of this weekend, Cronin turned in a stunning set of performances on his maiden season in the world championship, racking-up four podiums from the last four events to be in a position to challenge for the Top Driver title.